It isn’t easy being a newbie. Waves are terrifying, lineups are indecipherable, and intimidating locals speak a lingo that you are just beginning to grasp. The last thing you want is to get in someone’s way, but as with most activities, the only way to learn to surf is to dive into the deep end, put in your time, and take your beatings. Fortunately, not all breaks are created equal, and some are much more conducive to learning than others. You wouldn’t want to paddle out at maxing First-Reef Pipeline when you are just learning to stand up on a board, but a few dozen miles away the gentle rollers of Waikiki are a perfect place to practice your pop-ups and learn how to read a lineup. Likewise, the aggressive, experienced crowd at Snapper Rocks pretty much precludes any beginners from getting waves, but there are other, lesser-celebrated points on the Gold Coast where you can surf with just a handful of people while you master the basics, such as making the drop and pumping down the line. Some surf zones almost seem to be custom-built for beginners, whether due to accessibility, the waves on offer, or the infrastructure available. Here are three destinations to consider for your first surf trip. The east coast of Sri Lanka is home to nearly a dozen small, forgiving right-hand point breaks peeling in warm, crystalline water over fortuitously shaped sandbars. In other words, it’s a dream destination for novice wave sliders. For that reason, Arugam Bay (which is the area’s main surfing hub) can get quite crowded with beginner to moderate surfers from all walks of life, ranging from frothing Israeli rippers to middle-aged Euro tourists, and even dirtbag backpackers looking to catch a few waves for the first time. Fortunately, many of Sri Lanka’s other points are located within a short tuk-tuk ride of A-Bay, and most of them are empty most days, even when the point at Arugam is overrun with local and visiting surfers. 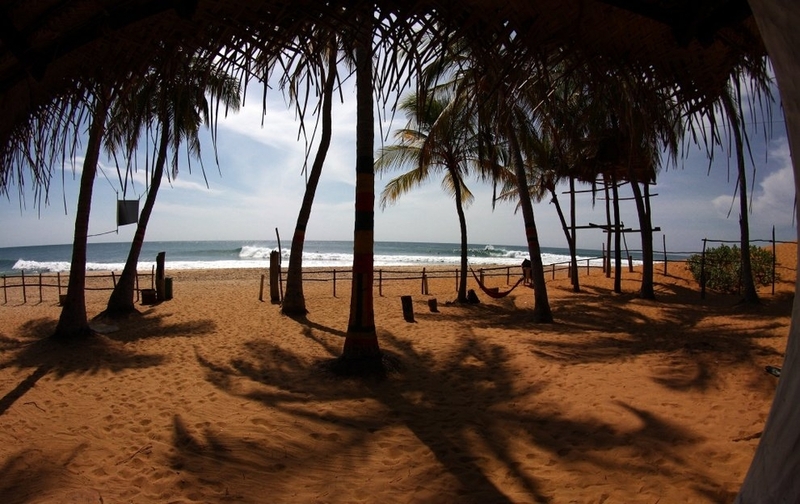 Between these empty, dreamy points, the welcoming local culture, delicious food and a very affordable cost of living, Sri Lanka is a great choice for a beginner or family surf trip. Visit during the monsoon season (June through September), when south swells are common and the predominant winds blow offshore. While Portugal doesn’t have warm water and an endless string of forgiving points like Sri Lanka, it does have more surf schools and camps than you could ever shake your fiberglass stick at. Most of the facilities are centred around Peniche, Cascais and Lagos, but Portugal is a lot bigger than those two cities, and has hundreds if not thousands of waves available—many of which are great for beginners, and most of which can be surfed alone or with only a few locals. Portugal has quickly become the go-to surf destination for European backpackers and weekend-warriors, with its affordable lifestyle, friendly, Old-World culture, and amazing seafood. Rent a caravan, find a strip of sand with a nice beach break and a nearby surf school, and settle in until you’ve perfected your cutback. While most of the Mexican surf spots you see in the media cater to intermediate and expert surfers (think the points in Salina Cruz and the XXL beach breaks in Puerto Escondido), there are also dozens of great beginner and family waves, both in southern Baja (near Cabo) and on the mainland. Puerto Vallarta is the hub of user-friendly waves in mainland Mex, with soft beach breaks and mellow points such as Punta Mita and Sayulita. The area gets pretty busy with tourists, but many are beginners or intermediate surfers at best, so the vibe in the water is pretty mellow, all things considered. Since the area is accustomed to tourists, there are lots of accommodation and food options at a range of prices, and the area remains relatively safe. If you are looking for a place to take the family, learn to surf, or have your first Mexican experience, you can do a lot worse than PV.